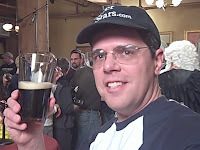 Last Saturday, February 21, 2009, a crowd gathered at the Wynkoop Brewery in lower downtown Denver to witness what can only be known as the ultimate competition for beer drinkers. 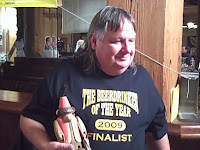 I'm talking about the 2009 Beerdrinker of the Year - The National Finals. 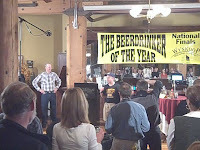 A crowd of nearly 200 people packed in a back room at the Wynkoop to watch as three finalists, chosen from hundreds, if not thousands, of resumes to compete before a panel of judges to be crowned the Beerdrinker of the Year. 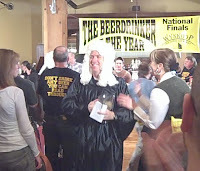 This competition got it's start 12 years ago in 1997 when the first beerdrinker of the year was crowned. The eventual winner must first be selected at a finalist and then survive nearly 9 rounds of questions from a panel of experts in the field. J Mark Angelus - a Oregon man who was a finalist in 2008. During the last year he sampled over 1029 beers, visited 93 breweries and sampled 244 Oregon beers at 11 beer festivals in his home state. Phil Farrell - a Georgia man who is a commercial pilot, a homebrewer, a beer jedge and a former 2007 finalist. 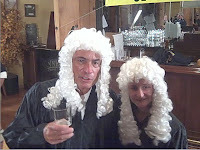 He's tasted beer in every European country, visited over 1000 pubs and 400 brewpubs. His basement bar has 6 taps, 2 fridges and a 15 gallon brewing system. Cody Christman - a Denver software engineer who just happens to be a regular patron at the Wynkoop. Cody teaches a Beer 101 class in his home that touts a bar with 7 taps and 3 fridges. He's tasted beer in 19 coutries and visited over 200 breweries. The back room of the Wynkoop, the Mercantile Room, was absolutely packed with beer fans. Each finalist had fans in the audience but it was apparent early on that local Cody Christman had the most supporters in the room. 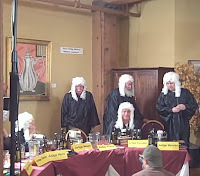 A panel of 7 beer judges, including a couple former BDOTY champions, some local beer press and writers, and rep from the Brewer's Association were all dressed in white wigs and black robes and each carrying in a glass or jug of their favorite brew. The competition was broken up into two sessions with a 20 minute break in between. The judges had a most difficult decision to make and deliberated for what seemed like 40+ minutes. 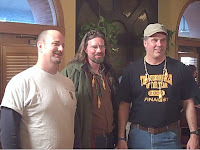 Finally, they came back in and last year's champion Mark Venzke was given the honors of announcing the 2009 winner of the Beerdrinker of the Year. And that man was Colorado's own: Cody Christman. Way to represent Colorado, Cody! Cody was most a most gracious winner. Along with the winners official BDOTY Champion T-shirt, Cody was given FREE beer for life at the Wynkoop Brewery plus $250 worth of beer at the winner's home pub, his name immortalized for all time on a trophy to be displayed at the Wynkoop, the right to produce a special batch of beer for next year's BDOTY competition at the Wynkoop and plenty of free shwag to wear as well. There were plenty of press and local beer dignitaries there including Denver Mayor (now Governor) John Hickenlooper and also local brewer Eric Wallace of Left Hand Brewery of Longmont. Grats to all of the finalists and the winner Cody. You guys certainly know a LOT about beer. Attached here is a video of the official announcement of the winner at the end of the competition. Below are several random shots from the days festivities. Enjoy! 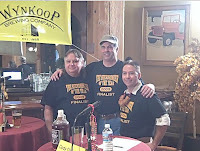 - A visit to the Wynkoop Brewery. 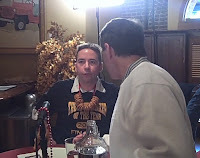 - BeerTapTV plans Denver Tweetup for March. - Mountain Sun celebrates Stout Month. - More Russian River beers heading to Colorado.